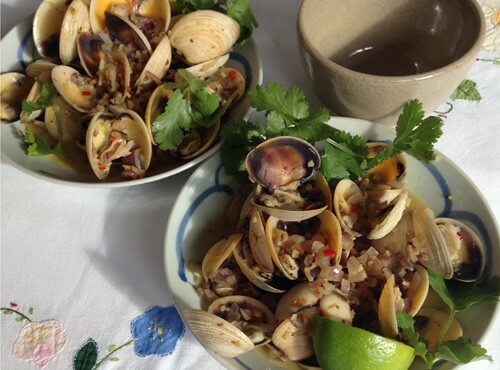 This recipe works just as well with mussels instead of clams. Heat a wok, then add oil. Stir-fry onion, ginger and garlic until onion is soft and garlic is golden. Add turmeric, coriander seeds and chilli and stir-fry for another minute or so. Add clams and wine, then cover and increase heat to maximum. When there is a gush of steam, remove from heat and sprinkle with lime juice. Serve immediately in hot bowls, scattered with coriander leaves.